This section contains common mistakes to avoide and tips for better writing, especially for early career researchers. We do not impose any word limit on the different types of articles and practice the philosophy that length of an article should be as it should be. However, writing should be concise and clear. Authors can get the advantage to explain methods in detail. Contributions should be in British or America English spellings and consistency must be maintained throughout the manuscript. Text should be double-spaced, without footnotes, and with line numbers. Type of an article is decided by the contribution to the subject but not by the length of an article. Authors are advice to consult a recent issue of JTE for general style. Title should be a succinct description of the work (≤ 25 words) preferably embodying either the aim, main results or the overall conclusion. The title page should also include the full name(s) and address(es) of all authors, clearly indicating the author to whom correspondence should be addressed. telephone and e-mail contact of the corresponding author should also be provided. Abstract should be in ≤ 250 words, the aims, methods, major findings and conclusions; should be informative without reference to the text and should not contain any references or undefined abbreviations. The body of the article should be divided into an Introduction, Materials and Methods, Results, Discussion, Conclusion (optional, if the conclusion section is omitted, a concluding paragraph can be included at the end of the discussion). Results and Discussion may be combined only if necessary; separate Results and Discussion sections are highly recommended. Methods and Results may have subheadings but not in Discussion. Short Communications must not have any subheadings but include all major sections as in articles. Scientific notes usually do not have an abstract, however the first few sentences of the first paragraph should summarize the content and contribution of the note. If a note is longer than usual, sections and subheading can be included for clarity. JTE follows the COPE, WAME, ICMJE, and CRediT guidelines for ethical publishing. A statement about author contributions must be given for full length research articles and review articles. Various author contributor roles as described in CRediT taxonomy [ Conceptualization | Data Curation | Formal Analysis | Funding Acquisition | Investigation | Methodology | Project Administration | Resources | Software | Supervision | Validation | Visualization | Writing – Original Draft Preparation | Writing – Review & Editing ] are recomended. If Animal or human test subjects involve, a statement about ethical treatment should be given. This may include the nature of the subjects (for example indexed or threatened animals according to CITES or IUCN redlists), any permission numbers, and the use of non-invasive methods on threatened species such as photography based survey instead of curated specimens or non-invasive DNA collections and release of species. JTE does not accept Plagiarism, and if detected COPE guidelines will be followed. Plagiarism which includes, but is not limited to: Directly copying text, ideas, images, or data from other sources or using an idea from another source with slightly modified language without attribution. Reuse of text from authors’ own published work without attribution also considered plagiarism. However, an exception is given to reuse of text from the Methods section in the author’s published work, with attribution to the source, when the exact method (section) as described in the published work is used. A conflict of interest is not intrinsically a wrong thing and authors must declare if any exist. Any research grants should be acknowledged here. Whose contribution is not enough to have co-authorships should be mentioned. Acknowledgements should not be unnecessarily long. Measurements must be stated in SI units. If other unites are used values in SI unites should accompany. Figures and illustrations are encouraged where they are a real contribution to the article. Figure legends should contain enough information to make the figure self-explanatory without reference to the text. Images in a composite figure should be numbered using simple English letters; if a composite figure or plate consist several sections, should be numbered using roman numbers and then the simple English letters (Figure 1. IV. c – f). All figures should be cited in the text as, Figure 1 or (see Figure 1. a – c) or (Figure 1. d) etc. not as shortened Fig. Composite figures or plates should be prepared using dedicated photo editing or illustrator programs (such as GIMP, Photoshop, CorelDraw etc.). Must not use Office software such as MS word for making composite figures. Authors are advised to keep all the figures used to prepare composite figures or figure plates and provide if journal requested. Authors may be requested to provide the data from which Figures are generated. Figures must be submitted in PDF, JPG or TIFF file formats in higher resolutions. Authors are highly encouraged to submit figures for cover photograph that are related to the submitting article. Maps should be prepared using dedicated software for cartography or GIS. Maps should only includ essential detail with minimum formatting. Tables are Each on a separate page, with captions that are comprehensible without reference to the text. Vertical lines are not permitted and horizontal lines are used only in the heading and at the bottom of the table. Supplementary material to accompany the online version of the article due to its nature does not lend itself to print media (examples- full data sets, movie or sounds files etc.) can be submitted after discuss with the editor. Examples: Single author: (Faleiro, 2006) Two authors: (Reddy and Bhaskaran, 2006) Three authors or more: (Kasina et al., 2006) Multiple citations: (Ajayi, 1990; Nwanze and Harris, 1992; El-Banhawy et al., 2006). With full journal titles in italic, volume number in bold, and issue number within brackets. Sinclair B.J., Vernon P., Klok C.J and Chown S.L. (2003) Insects at low temperatures: an ecological perspective. Trends in Ecology and Evolution 18 (5): 257–262. The title of the journal/book must be stated in the reference list as well as the expected year of publication. Omoogun G. A. (1994) Design and construction of the Nitse trap. Insect Science and Its Application (In press). Include the publisher's name, city of publication and page numbers. Mengech A. N., Saxena K. N. and Gopalan H. N. B. (Eds) (1995) Integrated Pest Management in the Tropics: Current Status and Future Prospects. John Wiley & Sons, Chichester, New York, Brisbane, Toronto, Singapore. 172 pp. IUCN (2008) IUCN Red List of Threatened Species. IUCN, Gland, Switzerland. Http://www.iucnredlist.org [accessed 24 July 2010]. All articles except editorials and book reviews are peer-reviewed. Members of international editorial board evaluate articles based on reviewer reports, advice in decision making and/or act as reviewers. Decision made by the editor-in-chief is the final decision. JTE uses single blind peer review by default where author information is revealed to reviewers. However, authors can select double-blind review if they prefer. Reviewers may sign the review reports if they wish to reveal their identity to authors. Editors make every effort to accept technically sound/scientifically valid articles with significant contribution to the knowledge of the subject. However, based on editors’/reviewers’ comments, one of the following decisions are made. - Reject after first review. - Reject with resubmission option. - Major revisions (subject for further review). Some of the articles that are not suitable for full length articles can be considered as short-communications or scientific notes based the amount of contribution and length. 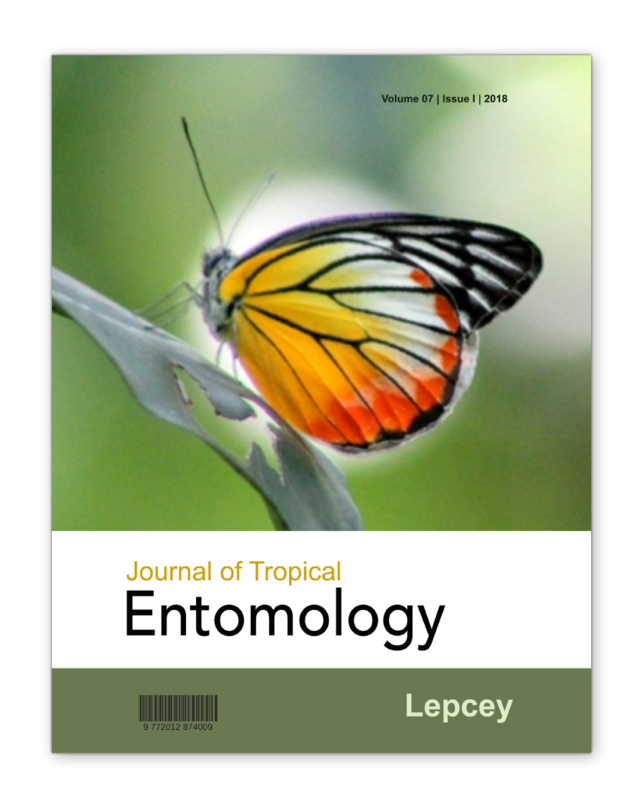 Aim of JTE is to accumulate the knowledge on tropical and sub-tropical insects, which is made available for free. JTE maintain the values of traditional publishing systems while embrace the advantage of modern digital publishing methods. The journal practice pure open access with CC BY-NC-ND 4.0 creative commons license. Journal published on a continuous publication model where papers are published as soon as they are accepted and ready. Articles are included in volumes and issues with article and page numbers. Currently JTE depends on the funds from its founder and NO article processing charges or any other fee applied to authors or readers.